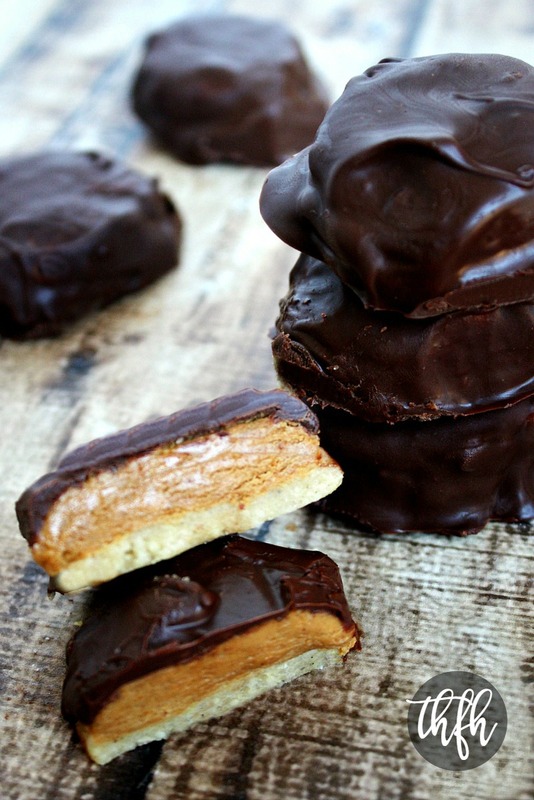 These Clean Eating Gluten-Free Vegan Copycat Peanut Butter Tagalong cookies are a healthier version of the popular Girl Scout cookie that you can enjoy guilt-free. 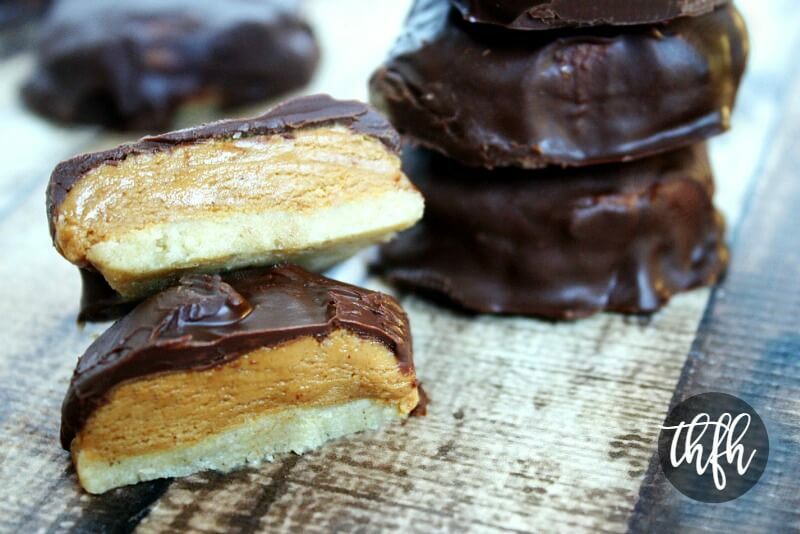 If you aren’t familiar with the very popular tagalong cookie, it’s has a shortbread-type cookie bottom, a thick peanut butter middle and is covered in chocolate. Of all the Girl Scout cookies I’ve eaten in my day, these were always my favorite. They were really, really good…but they are also really, really bad. They are made with GMO ingredients like corn syrup solids, high fructose corn syrup, soy lecithin and contain refined sugar and artificial flavors. The other bad thing is non-organic peanut butter can possibly contain up to 8 different pesticides. That’s why this is a perfect recipe to make your own homemade peanut butter with a Vitamix using 100% organic peanuts. And, homemade tagalog versions aren’t much better either. 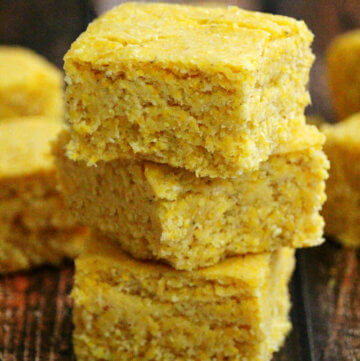 Ingredients: 1 cup butter, 1/2 cup white sugar, 2 cups white flour, 2 tbs milk, 1 1/2 cups peanut butter, 3/4 cup confectioners sugar, 4 tbs butter, etc. 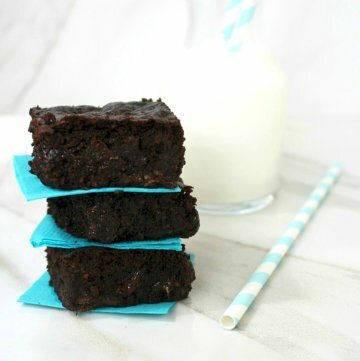 They’re have dairy (butter and milk), refined sugar (white sugar and confectioners sugar) and white flour, so they aren’t vegan or gluten-free. 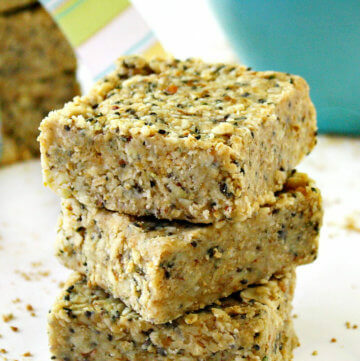 This healthier version is “almost raw” (peanut butter), vegan, gluten-free, dairy-free, no-bake and contain no refined sugar. 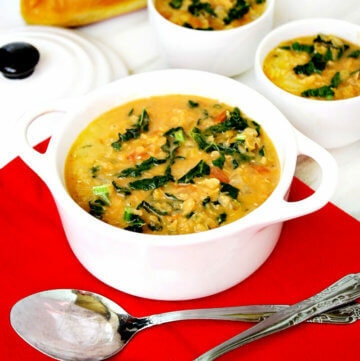 Want more healthy recipes? 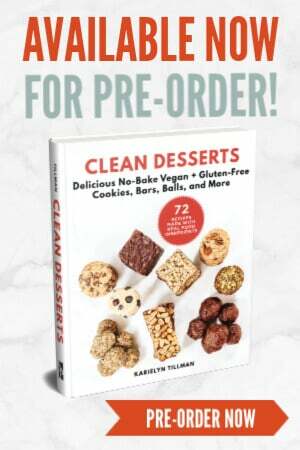 Check out Healthy Peanut Butter Cups, Clean Eating Peanut Butter Fudge, Clean Eating Chocolate Crunch Bars or my Clean Eating Cookbook with an entire chapter of 20 healthy, clean eating dessert recipes just like this one that you will love! Tip #1: This recipe can be made with homemade peanut butter using a Vitamix. For more recipes you can make with a Vitamix, visit my Vitamix Recipe Index page for more inspiration! Tip #2: These are best cold, right out the freezer! Step 1 Add all ingredients to a small bowl and mix until well combined. The mixture should be slightly moist and sticky. Flatten out, with the back of a spoon, into a 8 x 9 square shape on a baking pan lined with parchment paper. 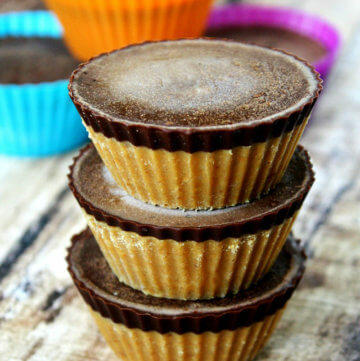 Put in the freezer while you prepare the peanut butter filling. Step 2 Add all ingredients for the peanut butter layer to a small bowl and stir until well combined. Add the extra 2 tablespoons of coconut flour, if needed, to be able to roll them into a ball shape. Take a spoonful out at a time, roll them into a ball shape and then flatten them into a disc shape. Remove the baking pan from the freezer and put each peanut butter disc on the cookie base, spreading them out evenly (see collage photo #1 in post). Using the tip of a sharp knife, cut out the base using the peanut butter disc as a "cookie cutter". Remove the excess pieces of cookie base and enjoy! You should have a cookie base that fits perfectly under the peanut butter disc (see collage photo #2 in post). 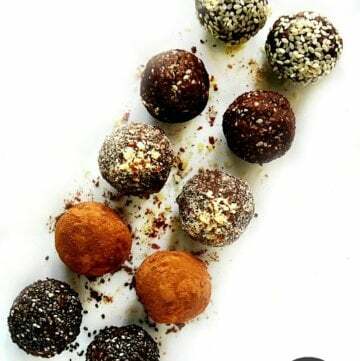 Put them back in the freezer while you prepare the chocolate topping. Step 3 Add the chocolate chips and coconut oil to a small saucepan and melt on lowest heat, stirring until the chocolate chips are completely melted and smooth. Take a spoonful at a time and drop on top of each peanut butter/cookie disc, letting it drizzle down the sides. Use your spoon to spread it along the sides like you would when frosting the sides of a cake (see collage photo #3). Put them back in the freezer to harden for approximately 30 - 60 minutes. 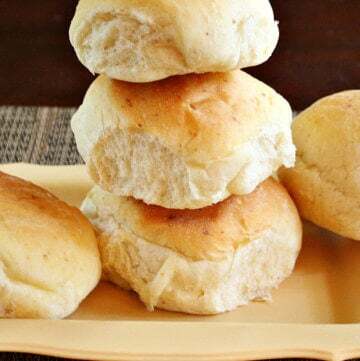 Store them in the freezer until you are ready to serve them because they will get soft and lose their shape if you leave them out at room temperature. 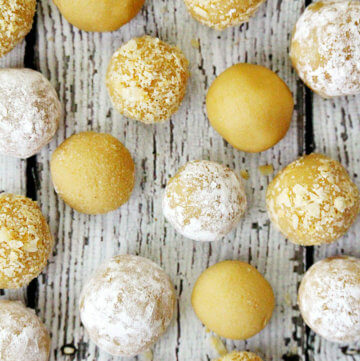 This recipe will make approximately 10 - 12 cookies. The recipe and photographs for "Clean Eating Copycat Peanut Butter Tagalongs" by Karielyn Tillman of The Healthy Family and Home are licensed under a Creative Commons Attribution Non-Commercial 4.0 International License and cannot be used without my written permission. I am so loving your recipes – thank you for sharing them! Lazy day question about this one – any reason why I couldn’t layer these ingredients in a pan and put the chocolate just over the top for a bar-type treat? Hi there Iris! Thank you so much for your kind words…I really appreciate it! I think that would be a great idea (I’m all for lazy and shortcuts!) and don’t see any reason why that wouldn’t work so I would definitely give it a try.